Mrs.Pomeranz is a sewing studio based in Moscow. We are a group of artists and dress-makers who create beautiful dresses and skirts based on a classical 50's silhouette. The key heroes of our team are: Dasha Pomeranz, Masha Kopieva, Tatiana Tokareva and Marina Vasilieva. Dasha and Masha are sisters. 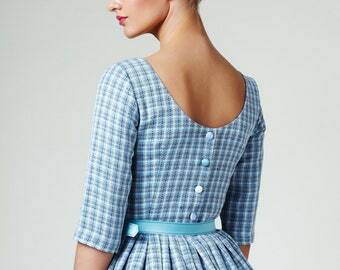 Their grandmothers were talented seamstresses and created beautiful dresses in 50s and 60-s . 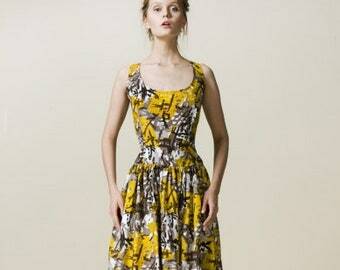 In 2006 Dasha began to collect American vintage dresses. She put together 300 dresses from the 50s and 60s. They were very feminine and personalised, very different to contemporary mass-produced models. 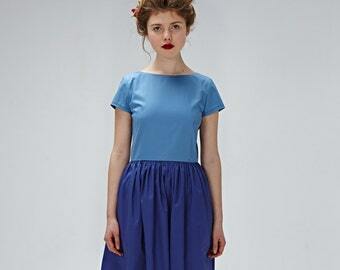 Dasha decided to fulfil her dream and open a sewing studio which would create contemporary models of 50 dresses. Masha joined the team and helped to create the first models for the collection. cuts don't necessarily match today's women, they can be too full in the chest and too thin in the waist. But Mrs.Pomeranz's dresses fit perfectly: the cut slims the figure, the length compliments the legs. 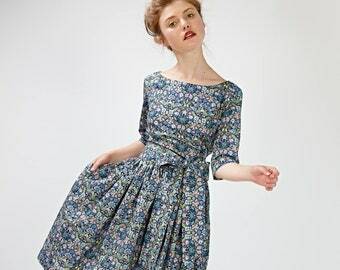 Thus the 'New Look' collection was born: dresses full of vintage grace but with a contemporary feel. Dasha and Masha create sketches of the dresses, invent the prints, choose the fabric for each dress and refine the handmade details of each dress. 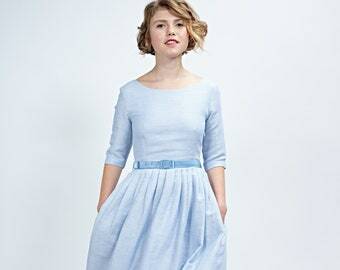 Masha's great passion is for wedding and bridesmaids dresses. Tatiana is a professional pattern cutter and dressmaker with over 20 years experience, silk ball gowns are her speciality. Marina joined us in 2012. She is a professional seamstress who works at one of Moscow’s most prestigious theatres, which has given her unrivalled experience in creating dresses from different periods, the 40s and 50s especially. The fabric is very important for us. We choose Italian and English Liberty fabrics with high-contrast prints and Scottish tweed. Each item is handmade in our Moscow studio and we do everything to create the perfect cut and to make every seam and stitch as neat as we can. We believe in making special dresses in which special things happen. This was my first purchase and I ordered 2 items at one go. i’m pleased with the outcome of both my dress and skirt. Workmanship is great and the measurements were exact. Dasha was prompt in her replies and her advices were helpful when I was debating on the choice of fabric. Overall a great experience! Beautiful dress. Very good quality fabric. Dasha has been listening to my expectations. I recommend. Magnifique robe. Tissu de très bonne qualité. Dasha a été à l'écoute de mes attentes. Je recommande. 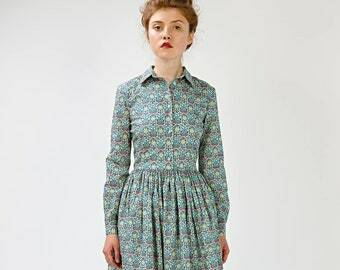 Another beautiful dress in the prettiest Liberty print. A great fit and extremely well-made. 600 sales on Etsy! Very humbled and grateful for the support! American writer Sana Krasikov in Mrs Pomeranz floral jacquard dress. 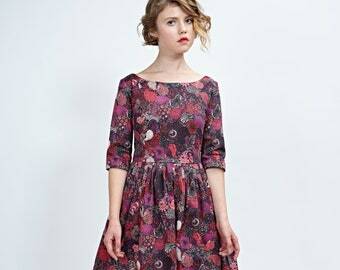 Amy Spencer (The little magpie blog) in Mrs Pomeranz dress. 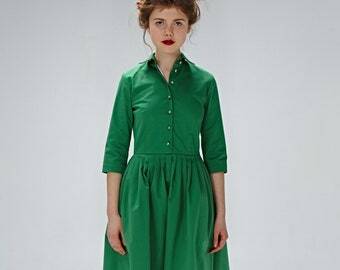 In 2006 Dasha began to collect American vintage dresses. She put together 300 dresses from the 50s and 60s. They were very feminine and personalised, very different to contemporary mass-produced models. Dasha decided to fulfill her dream and open a sewing studio which would crate contemporary models of 50 dresses. Masha joined the team and helped to create the first models for the collection. 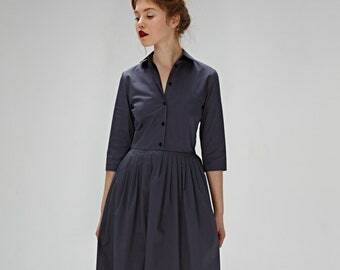 With their trusted constructor and dress maker Tatiana they carefully reworked original patterns to fit the modern female figure: vintage cuts don't necessarily match today's women, they can be too full in the chest and too thin in the waist. But Mrs.Pomeranz's dresses fitperfectly: the cut slims the figure, the length compliments the legs. Thus the 'New Look' collection was born: dresses full of vintage grace but with a contemporary feel. Tatiana is a professional pattern cutter and dress maker with over 20 years experience, silk ball gowns are her speciality. Marina joined us in 2012. She is a professional seamstress who works at one of Moscow’s most prestigious theaters, which has given her unrivalled experience in creating dresses from different periods, the 40s and 50s especially. Fabric is very important for us. We choose Italian and English Liberty fabrics with high-contrast prints and Scottish tweed. We believe in making special dresses in which special things happen. 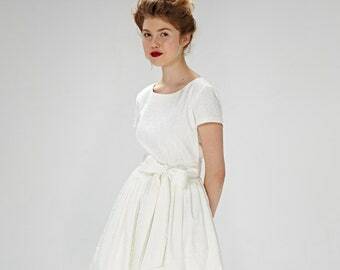 When you put on Mrs.Pomeranz's dresses you feel feminine, fun and oh so 1950s. These are dresses which are all about being a woman- and loving it. 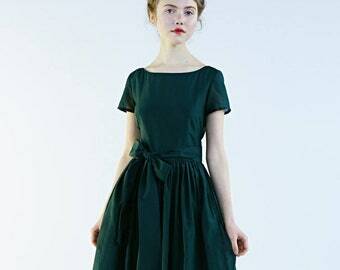 Dasha had been collecting vintage dresses for several years and created Mrs Pomeranz in 2009. Masha create sketches of the dresses, invent the prints, choose the fabric for each dress and refine the handmade details of each dress. 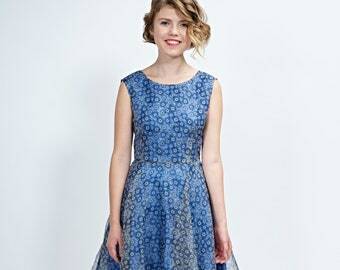 Masha's great passion is for wedding and bridesmaids dresses. Marina is a professional seamstress who works at one of Moscow’s most prestigious theaters, which has given her unrivalled experience in creating dresses from different periods, the 40s and 50s especially. Factory of nice apparel Number one Moscow is one of the best sewing companies in Russia. They work for 5 years and help lot's of Russian designers to create their collections. There are 14 seamstresses and 2 pattern cutters working full time. 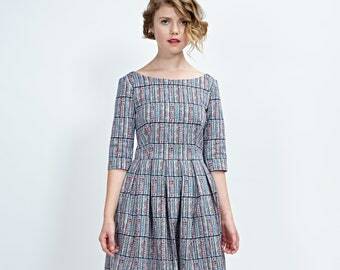 IP Tolstih are based in Moscow, they sew dresses and jackets and offer the grading service. They don't have minimum orders which is very impoortant for the small clothing brands. The company is based in Kostroma. It is a family run business which started in 2010. There are around 7 seamstresses working full time and 2 pattern cutters. They work on Juki machines and overlocks. Thank you for visiting our shop! The following policies are to let you know what to expect when working with us. We understand that you may occasionally want to return items that are not suitable. If you are not satisfied with an item purchased from Mrs Pomeranz please write us within 3 days after receiving your order. We will provide the return address and aim to refund you within 10 days after receiving the item. Items should be unworn, in the same condition as you received it with no signs of wear. We do not offer refunds on made to measure orders, because each item is handmade to fit your measurements and we won't be able to resell it in our shop. Please measure yourself carefully. The better you will take the measurements, the better will be the fit. We can always alter the dress for you for free but we will ask you to pay for the shipping. 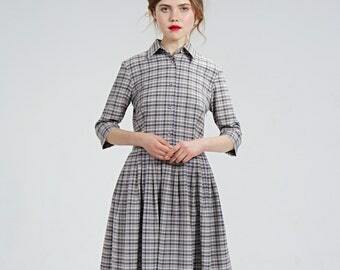 Please contact us within 3 days after you receive the dress, write us a letter with comments and photos and send the dress back to our office in Moscow. We will alter it within one week and send it back to you. We recommend Paypal. It's convenient and protects your rights. You can also pay by credit card. We can't accept money orders or cheques. We ship worldwide. The shipping cost is in the item description. We also do the combined shipping, the price for the combined shipping is listed in the shipping profile. We use International AIR POST service as our default shipping method. It's fast and reasonably priced. It usually takes 12-17 days to ship to US, Canada, UK, Australia and other countries. We will use your etsy address as shipping address, please make sure it is correct. If you want to receive your dress quicker, please write us and we will give you the quotes for special delivery (Fedex, EMS, DHL). We charge 50 pounds more for urgent orders. Please inform us about this before you place an order. We buy Liberty fabric in London. It takes up to 3 weeks to ship the fabric to Russia from London, so it can take a little bit more time for us to start working on your dress. However it usually takes no more than 6 weeks. If you don't receive your dress within 30 days, please write to us and we will start the investigation process with our post office. 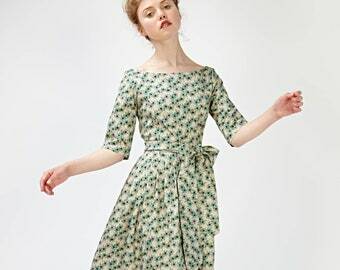 Q How to choose a fabric for the dress? We exhibit dresses we made previously, so sometimes we don't have exactly the same fabric as on the photo. However we will send you several samples of similar fabrics to choose from. We choose the best fabrics from Italy, Japan and UK. 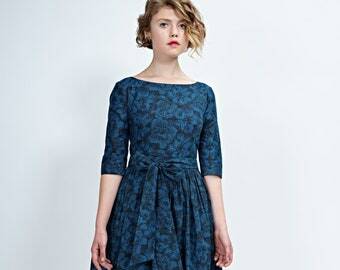 Q Can you reduce the price if I would like to make a dress using my own fabric? Yes, we can. Please write us and we will reduce the price and create a special listing for you. However it will take longer and you need to pay for the shipping of the fabric to Russia. Q How to take measurements correctly? We will send you a very detailed leaflet with photos and pictures explaining how to take measurements. You can always write to us if you have any questions about this process. We also need 2 photos of you in fitted clothes front and side. We need them to double check the measurements you send us. Q How long will it take to make a dress? We do all we can to start working on your dress as soon as we receive full information from you (measurements and photos) and we buy the fabric. But we can start working on your dress оn any date within 2.5 weeks, as we have previous orders that need to be finished. Please don't worry if we will ask you several questions about the fit or your measurements 10 days after you place an order. It usually takes up to 2.5 - 3 weeks to make the dress. For dresses made of Liberty fabric or Mrs Pomeranz's fabric the process can take up to 6 weeks (we order these fabrics abroad and need some time to ship it to Russia). Q Do you make plus size dresses? Yes, we make plus size dresses. We sometimes advise you to change some details on the dress (for example to make an A-silhouette instead of pleated or gathered skirt). Please write us that you want to make a plus size dress and mention measurements in the letter (bust and waist). We will confirm the price within 1-2 days. Q Do you give any discounts? We don’t usually give discounts on our dresses, as they are hand made and we use only high quality fabric. We can save on combined shipping on more than 2 garments. Q Do you give dresses for a giveaway in blogs? Yes, we do, if we consider the blog interesting and popular. Please write us a letter and we will answer you shortly. Q Do you offer wholesale? Yes we do. Please write us and we will give you the quotes. We collect information about you when you register with us online, place an order for products or services online. We collect information about you to process your order, manage your account or loyalty scheme, and if you agree, to e-mail you about products and services we think may be of interest to you. We will never share your personal information with anyone for marketing purposes. If you have consented to receive marketing we will send you information about products, services and opportunities which might interest you. You have the right at any time to stop us from contacting you for marketing purposes by clicking the unsubscribe link at the bottom of any newsletter. Please see Etsy policy about using the cookies.